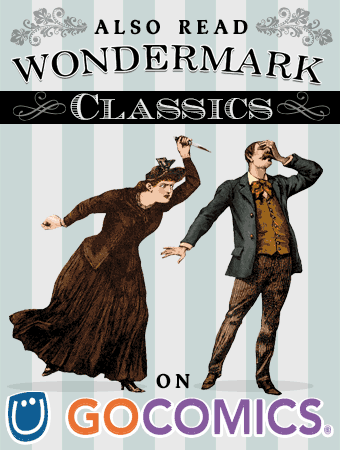 Wondermark » Archive » Coloring contest winners! Thanks to everyone who took the time to enter the coloring contest — we had 53 entries, which is a ton for a contest that only ran for seven days, and I’ve now made the acquaintance of many very skilled colorists, which will be a great asset moving forward into new projects. The final decisions were difficult, but we had to take into consideration thematic concerns, what the strips would look like on paper, and how they would incorporate into the existing page designs. I think we made decisions that will produce the best book as a whole package. The book will also contain five strips colored by Carly Monardo, my collaborator on the Futurism poster. Where are their entries? 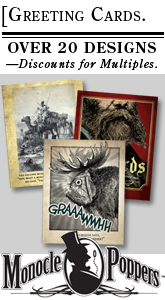 Why, they’ll be printed in Clever Tricks to Stave Off Death, out in May! #291 by Katherine Wirick (website). Katherine did some nice work in the skin tones, giving the shapes dimension. #302 by Christina Major. Christina was the only one to color all six comics! In this one she’s explained why, exactly, the Moon is so annoying. This made me laugh out loud. Nicely done, Christina! #302 by Danielle Gavino. This was a really lovely take on the strip. I commend Danielle for a creative palette choice! #324 by Shazzbaa (website). Shazzbaa was one of several to use color to make the Walt-Whitman-headed bat slightly more magical. I also like the muted palette. #333 by Taryn Trousdale (website). Taryn made extensive use of textures in her entries, which is something I do a lot of in my books as well. These honorable mentions will all receive prizes for their effort! WHAT PRIZES? Who knows! Thanks so much for your work, everybody. It’s been a real treat to see! Exactly what I’d hoped for has happened: folks have applied their very divergent personal styles to make these strips unique and distinct from one another. 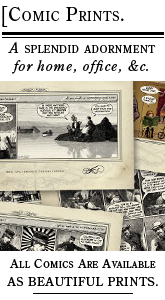 The six strips chosen for the book are very different from these as well, and I think you’ll really enjoy seeing them in May! Finally — these six strips are now colored and done, but I’ll extend an open-ended invitation to anyone and everyone: If you’d like to take a crack at coloring your favorite strip(s) from the archive, just drop me a line and I’ll send you the full-rez, layered file. If I like your coloring, I’ll replace the black & white version in the archive with your version, and include a link to your site! Easy as that. (You just have to promise not to take it personally if I don’t like it, my standards are pretty high for this sort of thing.) Of course, any entries submitted will also serve as auditions for paid coloring work, just like these have been. So there you go! What are you waiting for, etc. This entry was posted on Wednesday, January 7th, 2009 at 12:56 pm and is filed under Blog. You can follow any responses to this entry through the RSS 2.0 feed. Both comments and pings are currently closed. Walt Whitman headed bat gets me every time. I dig the color version of Whitman bat and the annoying moon. Sweet. Thanks so much for holding the contest! These were a blast to color! 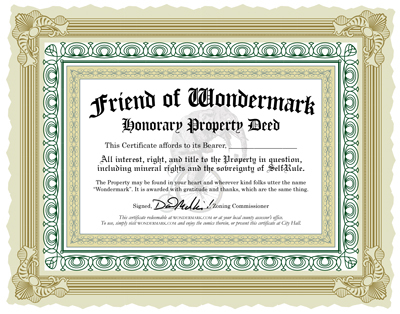 Although I think the link is a little borked after my name, it seems to want to go to a Wondermark page that doesn’t exist (it’s “korybingaman.com” or “skindeepcomic.com”). Please don’t replace the original black-and-white version in the archive, but add a link to the colored one, or add it below the original. I like to compare the colored versions with the originals, to see what choices were made and so (like the moon, in #302: it added something which the original didn’t have, but the original was nice too).